Crown of Thorns Gourd Seeds 5340. 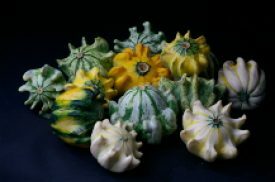 Unique claw-like projections form on small colourful gourds. 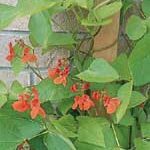 This is a good selection for small gardens as the vines are quite compact. Fruit colour varies from cream, yellow, orange to green with stripes. The gourds average about 10 cm (4″) across. When the stems turn brown and dry, the gourds are ready for harvesting. If you are cramped for space, gourds easily lend themselves to growing vertically on a trellis or other supporting structure. Gourds are a hot weather crop. They need full sun and deep, rich, well drained, organic soil with a pH of 5.5 to 6.5. Before planting, work in lots of compost. Directly plant seed outdoors in late May to June 2.5 cm (1″) deep in hills 2.4 m (8′) apart with 4-6 seeds per hill. After germination, thin to 3 plants per hill. Seed can be started indoors 3 weeks before the plant out date. They do not transplant well–use paper or fibre pots that can be set directly in the soil. Protect mature fruits from frost and cold temperatures.